You've seen THOSE people before. They are in the parking lot with an item too big for their car and they are trying desperately to squeeze it in. "Maybe in the trunk?" "How about across the backseat?" "I Think I could probably tie it on top!" We go by and laugh, "What were they THINKING??" Today, we WERE those people! We made the trip to Home Depot with our bathroom list and wanted to get it all over with. Wes took care of the sink, cabinet, hanging cabinet, mirror and plumbing and I went and picked up a couple of lights. It took two carts; a shopping basket and one of those big flat bed carriers. I looked at the load and wondered how in the WORLD it was going to fit but Wes said that if it didn't fit, we could come pick up the rest tomorrow. They called an employee to help us "load" the items. He did one of those looks at the cart, then the car, then the cart... you know one of those "What were you thinking??" looks. But he tries. He gets out his tape measure and measures the boxes, then the car then the loading began. I don't know if you can tell or not, but it ALL FIT!! I'm serious!! 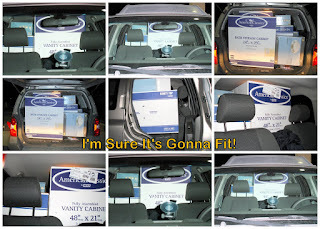 It took up the entire back of the car from the back of the seats to the back door and from the right side door to the left door and all the way to the ceiling, but it fit. I just had to take a picture (or 7) just so you would believe me. Check it out! We'll have to go back with a truck for the tub/shower enclosure. That's right.... we KNOW that won't fit! Saturday is the big day of the tear down and fix up. Wes did take some before pictures and oh, I can't wait to share the afters!